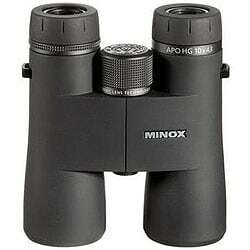 MINOX Optics are another manufacturer from Germany that produce binoculars of the highest standard. Like many of the other German optical companies including Steiner Binoculars, Leica and Zeiss, they pride themselves on the quality of their workmanship. MINOX are probably best known for their spy cameras which have some of the the highest quality lenses in the world, but they also manufacture monoculars, spotting scopes, night vision devices, riflescopes and the range of Minox binoculars are some of the very best available. 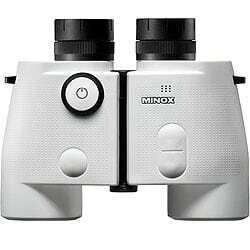 MINOX is also a very innovative company and they produced the worlds first purpose built digital camera monitor and eyepiece that fits to the end of a spotting scope as an affordable way of getting into digiscoping, perfect for both birdwatching and wildlife viewing. 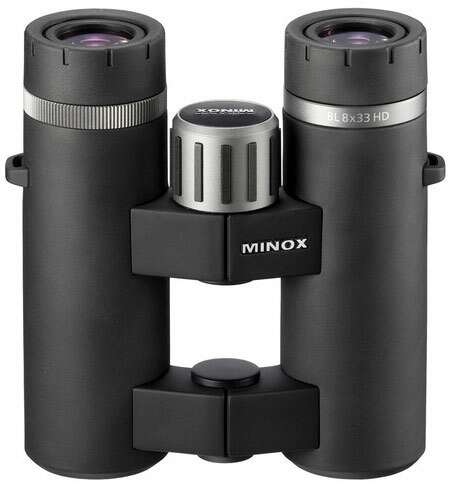 The MINOX binocular range is based around the highest quality optics and produced mostly for serious bird watchers, nature observation, marine use and as hunting binoculars. 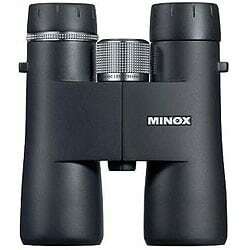 All MINOX binoculars feature a multi layer coating on all air to glass surfaces. This reduces any reflection and makes the image sharper and even more brilliant. The prisms in the MINOX binoculars are coated with a phase correction layer which enhances the contrast, even in difficult light conditions, therefore increasing the twilight factor of these new variable power binoculars. With the BL-HD series, Minox have added some pretty impressive refinements to their already very good BL series and thus have improved them even further. As well as the obvious slight changes to the looks and design, they now use HD glass elements in their lenses. This extra low dispersion glass (ED) has a property know as anomalous partial dispersion which means that the different color wavelengths are refracted non-linearly, which makes it possible for the lens designers at Minox to combine different types of glass in order to reduce chromatic aberration, the cause of color fringing, which is not possible with normal optical glass. Like the standard open bridge BL models, all BL-HD binoculars feature a lightweight open bridge design, phase correction coatings on the roof prisms and are sealed and then filled with nitrogen to make them fogproof and are waterproof tested to a depth of 5m. Made by hand in Germany, they are also exposed to a meticulous quality control inspection before leaving their factory and all Minox BL-HD binoculars come with their "Comfort Service", which after what they say is a "simple registration", you get an extended protection from all manufacturing and functional defects for an impressive 30 years. One of the first thing you notice about the new MINOX BL binocular is the very comfortable open bridge design, which I love as they not only help to keep the weight of the binocular to a minimum, but they are easier and far more secure to hold in one hand when you are not actually using them, but say walking through thick bush. The letter "L" in the name stands for "Light", which refers to their light weight (The BL 8x33 weigh's just 650g), but it could also stand for their light gathering capabilities: High quality components are used throughout with fully multi-coated optical elements and BaK-4 phase corrected high-reflection prism that give a sharp and high-contrast image over the full field of view. 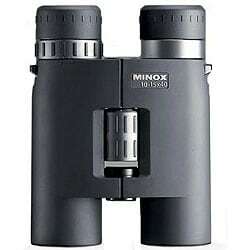 Minox has increased their already impressive field of view by 16% on the new BL range. The BL 8x33 BR now has a field of view of 8,0° or 421 ft at 1000yards, easily making it into the class of wide angle binoculars and ideal for spotting any moving object even quicker than before. All BL binoculars are 100% waterproof down to a depth of 5m (16.4ft) as well as Fogproof as the body of the binocular has been filled with nitrogen to ensure there is no internal fogging in extreme climatic conditions. New: MINOX announce two new models to their BL series binoculars - The MINOX BL 8X42 and BL 10X42 Made in Germany Edition Binoculars. For more information, read my article on the announcement of the New MINOX BL "Made in Germany" Edition Binoculars. These are the companies flagship bin and what sets the APO binoculars apart from the rest of the MINOX range are the SCHOTT fluoride ED-glass lens elements that they use in their Apochromatic Triplet Lenses. What this basically means is that these Minox APO HG Binoculars are apochromatically-corrected or in other words, at least three wavelengths of light are brought into perfect focus after going through the lens . Compare this to the vast majority of other binoculars that only bring two wavelengths into perfect focus and you can understand why these and other APO binoculars produce such a brilliant color-fringe-free image. What is more, SCHOTT, who designed the glass constituents for the APO technology is one of the very best glass manufacturers out there, with other companies like Zeiss also using their products on their top of the range models. One of the elements in their lenses is the very high spec N-PK 52 A ED glass, which is said by Minox to have an optical performance that is nothing short of extraordinary. Minox also use aspherical lenses within the eyepieces, which ensure uniform sharpness from the middle of the view, all the way to the edge. All the best bits from the MINOX HG line of Binoculars have also been incorporated into the APO series, including Quick-Close-Focus and the MINOTEC multi-coating, a nanotechnology that is said to help repel dust and water from the external optic surfaces. All MINOX APO HG binoculars have a large metal focusing wheel with a cross knurl and to prevent any reflections that could potentially frighten birds or wildlife, all these parts have an anodized gun-metal grey finish, which shows an excellent attention to detail. APO-HG binoculars come a leather case inside a beautiful wooden box together with a neoprene strap and lens cleaning set. Expect to pay top dollar (or pound) for these very top of the range binoculars. All the MINOX HG Binoculars have the Quick-Close-Focus (QCF) feature which was developed and patented by MINOX where you only need one full turn of the focusing dial on the binoculars to adjust the HG binoculars from close focus to infinite. This gives you fast close focusing as well as more precise focusing for longer distances. All HG binoculars have MINOX's M* multi coating of 21 layers and the silver-bearing Minobright reflection of the phase-corrected roof prisms. The innovative M*-coating of the lenses which consists of up to 21 different layers on the glass surface is there to modify the various wave lengths of light. This increases the light transmission up to an impressive 92 percent and improves brightness, contrast, details and colour rendering significantly. Another major benefit is an improved optical formula. Aspheric lenses enhance the contrast and sharpness of the image from the centre to the edges. To ensure a very reliable and durable protection against internal corrosion and fogging, the new HG’s are filled with state-of-the-art Argon gas. The body of the binocular has a fully protective rubber armoring and was designed by Volkswagen-Design specifically with feel and absolute comfort in use in mind. The body is constructed of magnesium meaning the weight of the binoculars has been considerably reduced. The range of MINOX BV Binoculars are described by the manufacturers as being "Popular binoculars for the price-aware outdoor enthusiast"
So basically these are the cheaper binoculars in the Minox range. This value for money line, for me make some of the best safari and wildlife viewing binoculars, as you still get many of the features and the quality on some of the more expensive MINOX binoculars, but at a much more affordable price, so it won't hurt so much if you luggage was to get lost on that safari holiday! The MINOX BV 8x42 BR and BV 10x42 BR binoculars, like the more expensive ranges from MINOX, still feature multicoated lens elements which reduce glare to a minimum and provide exceptionally high light transmission as well as neutral colour rendition of the subject in view. 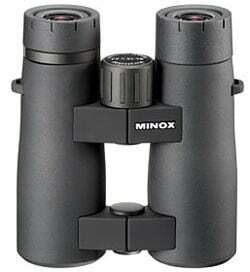 Available with a 8x or 10x magnification I feel that these new MINOX BV binoculars make the perfect low cost alternatives for nature observers, hunters and birders. 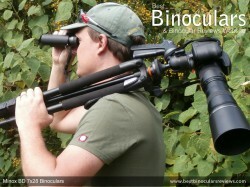 There are two compact binoculars in the value for money BV range of binoculars from. The MINOX BV 8x25 BRW and the BV 10x25 BRW are the perfect pocket binoculars for traveling, taking to sporting events or nature observation where space and weight is at a premium. These compact binoculars have an exceptional price-performance ratio and make an ideal choice for those looking for a small, top quality yet still affordable pair of binoculars. 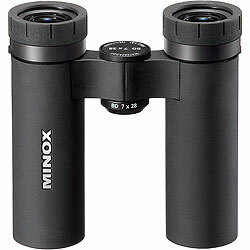 The line of MINOX BD Binoculars consists of three pocket sized (compact) binoculars and includes the very distinctive 7x28 IF Binoculars (see image on the right). All three models in the BD range use roof prisms and all are multi-coated with anti-reflection coatings. Only the newer 7x28 BD binocular is water and fogproof. As with most compact binoculars, they are ideal binoculars for traveling, taking to sporting events or nature observation where space and weight is at a premium. I would say that these compact binoculars offer a very good l price-performance ratio and make an ideal choice for those looking for a small, top quality yet still affordable pair of pocket binoculars. On Safari with the Minox BD 7x28 Binoculars - Why I chose to take these as well as the Swarovski CL Companion 8x30 binoculars with me on safari and my thoughts and findings on them both after my return. Compact Whitewater Rafting Binoculars - Why I recommend that a raft guide who needs waterproof compact binoculars for wildlife and birding whilst white water rafting should choose the Minox BD 7x28 bins. The Minox Nautic Marine Binoculars are innovative and professional binoculars designed to meet the extreme requirements encountered at sea and have been engineered to the highest standards with sailing, boating and other water sports in mind. 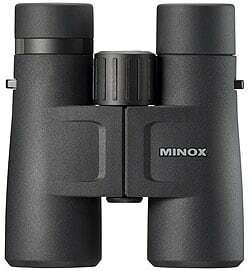 MINOX also produce Porro Prism Binoculars in their range with the 8x44 BP and 10x44 BP Binoculars. The advantage of the Porro prism over roof prisms, are the usually higher light transmission, as less light is lost in the optical path through reflection, on the way to the eye, But tend to be heavier and larger then roof prism binoculars. As I go into great detail in my article on Self Focusing Binoculars about how they work and the fact that every manufacturer has their own name for what in effect are fixed focus binoculars, MINOX are no different and their range of fixed focus binoculars are known as Individual Focus Binoculars as once the binoculars have been adjusted to your eyes, no further focusing of any kind is required. Advantages are that they are exceptionally robust and simply indestructible because of the fewer moving parts as well as locating fast moving objects like birds quickly as you do not have to focus. MINOX also produce a range of pocket size binoculars as well as binoculars that feature an altimeter, that are small and compact and thus very useful for mountaineers and climbers.